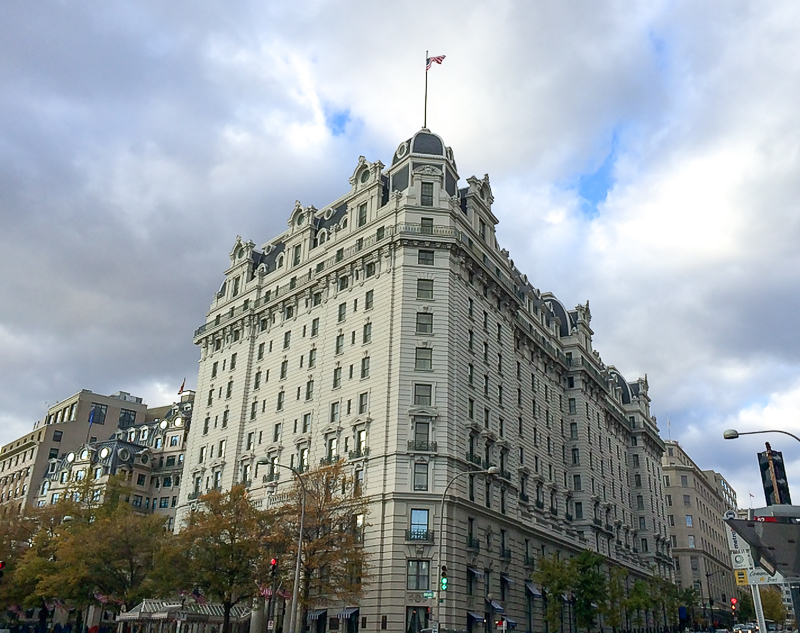 The Willard Hotel, a landmark at 1401 Pennsylvania Avenue NW (next door to the Prez), has its ghosts – but not just any ghosts. These would be seriously high-class ghosts. US Presidents, foreign dignitaries, movie stars, poets, writers and even a world famous circus master. The hotel is well known for its posh, upscale ….everything – past and present, from its grand lobby, to its huge rooms, spa and restaurants, and of course there is the expected hefty price tag – the cost of being high-society. I grew up just outside of DC and can still remember my mother talking about The Willard like it was some Mecca for the upper class. 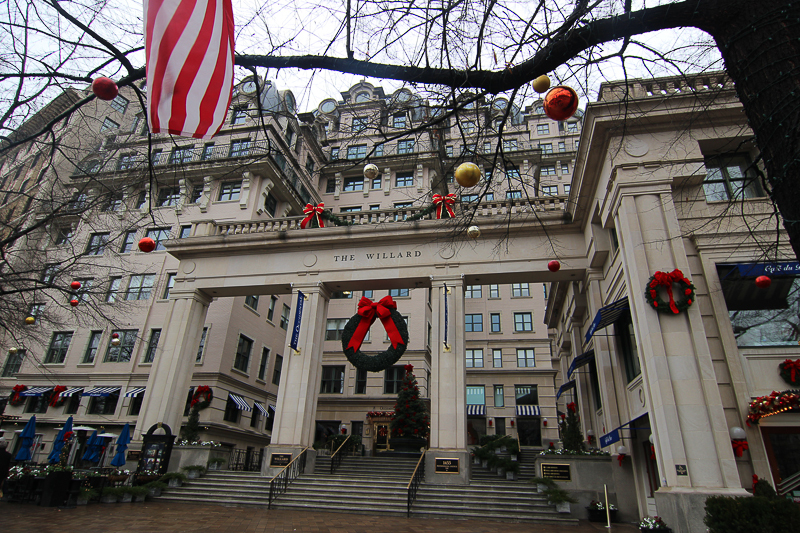 She said “Tea at the Willard” like Tallulah Bankhead said, “Lunch at the Plaza, Dahling.” Don’t be too impressed I grew up in Riverdale and the most upscale thing we ever did in DC was go downtown at Christmas and look at the decorated windows at Woodward and Lothrop. 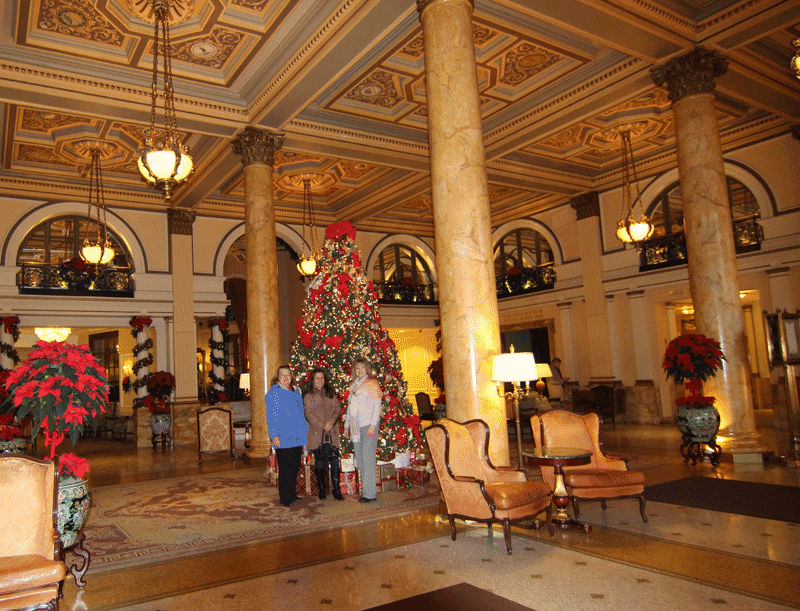 A group of us Travel Hags booked ourselves into the Willard during Christmas week – an incredibly slow time for city hotels. We got an excellent break on the price ($199 down from the normal $299 per night), and we spent one wonderful night and two fun days hanging out in that grand lobby, strutting down Peacock Alley and grilling the staff about food, entertainment and ghosts. When I pulled this group of hags together they were defining “stay at the Willard” to mean “Tea at the Willard.” Who doesn’t love Afternoon Tea? One can have tea at The Mayflower or Tea at the Ritz Carlton, but every Washington DC Tea experience is going to be held up against Tea at the Willard. It’s an institution. Sadly, we missed Tea at the Willard because it was booked up way ahead of time. We did, however enjoy a wonderful Tea at the Henley Park. It was the only place nearby serving Afternoon Tea on the Monday before Christmas. This was the second time in a month that I was turned away for Tea at the Willard for not having a reservation. But I was curious to see if it was as wonderful as I had remembered it. On this visit I took some time and observed the Willard Tea experience. It’s nice, but in my opinion, it’s way overrated. 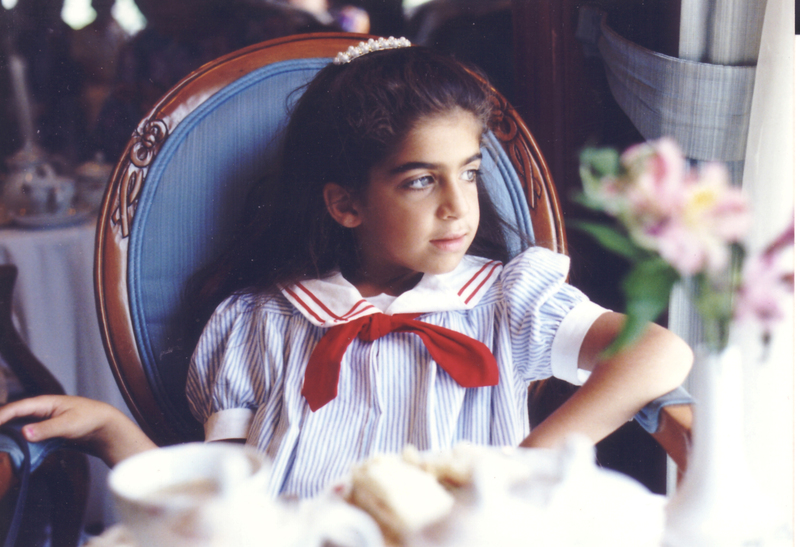 The photo above shows my then six-year-old daughter having Tea at the Willard in 1990. We did this often when she was little. Afternoon Tea was held in a wide 2nd-floor room with bright light streaming in through the windows with views of Pennsylvania Avenue. Round linen-covered tables with Victorian-styled chairs filled the room that was also decked out with fresh flowers. Tea included several courses. The first course (after making your choice for tea) was fresh scones with clotted cream. The next course was finger sandwiches, followed by a final course – a choice of fine pastries. The china was beautiful and the service impeccable. The price was high – the highest in town for Afternoon Tea, but the experience was superior. What I observed this year was entirely different. The tea was served in a crowded, tungsten-lit room off of the lobby with no windows. It well also served at the tables along the walls in Peacock Alley and may have also been being served in a room off of Peacock Alley, but I couldn’t determine that. When I inquired about having tea, the hostess was abrupt on both occasions (not typical for the Willard), quickly shoeing us away because they were booked up. It seemed they were not only not accommodating to walk-ins (how low-class of us), but perhaps annoyed by it. The servers appeared rushed, dodging the tables with their trays in such close quarters and having the Tea experience happen all around the outskirts of the lobby (or at least it seemed that way) reduced the singular experience – the special “Willardness” of having tea there. However, the harpist playing in that room off the lobby was a nice touch. But there was no light – no airiness. And those having tea were outside from the lobby grandeur. The price? $49 per person and $65 if you want champagne just clanged – Afternoon Tea Fail. Unlike the other special touches of the Willard experience, the value of Afternoon Tea didn’t match the price. Though Afternoon Tea wasn’t what I’d hoped, everything else at the Willard exceeded our expectations. 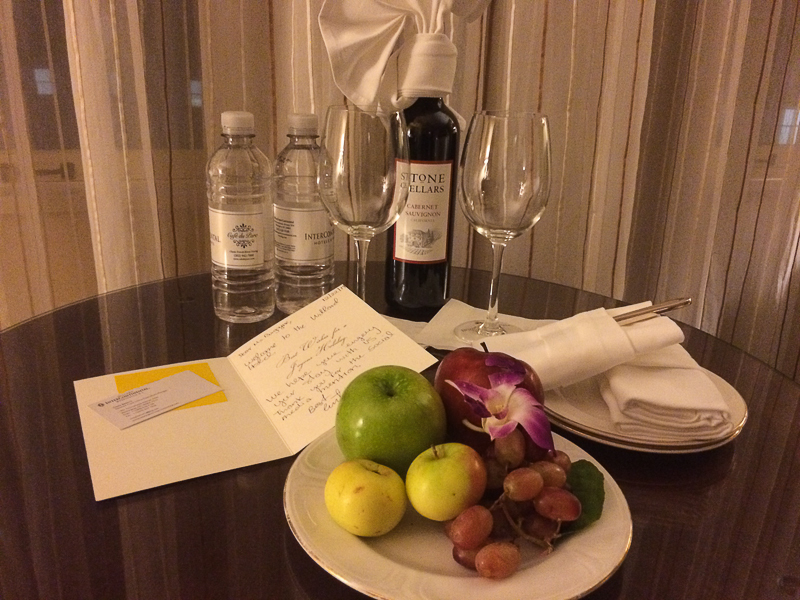 The service was fabulous, the rooms were huge, clean and updated. 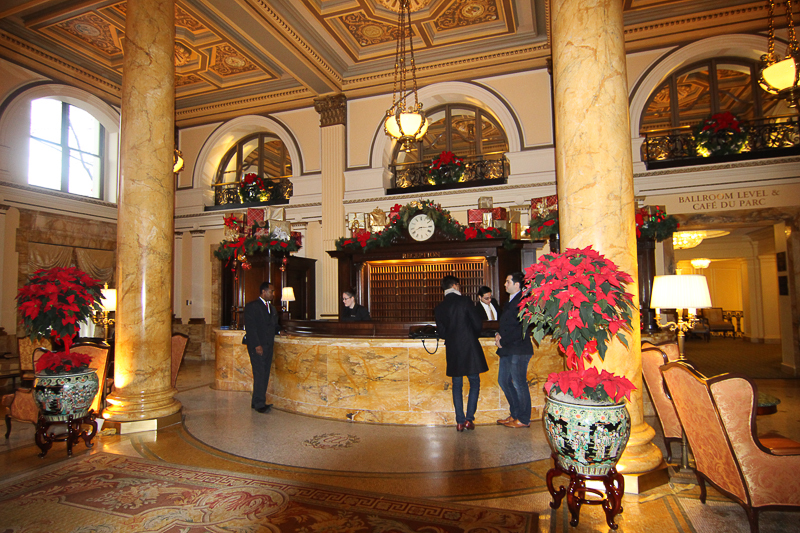 The Willard lobby is so much a part of the experience. Guests are encouraged to linger. The staff is welcoming. The hotel occasionally hosts small performances in the evenings during the week – free to the public – where they serve light refreshments. There was a Christmas Chorale there during our stay and the lobby was packed. The Concierge has his own office off of the Lobby and is as experienced as you’ll ever find. I asked him, “Why is the Willard the best hotel in DC?” He replied, “The Willard is ONE of the best hotels in DC – for three reasons. History, location and service.” Then he elaborated. The conversation was uplifting, and warm. Welcome to the Willard Hotel. Thank you for the social media mention. A note (and gift) from the Willard Sales Office thanking me for my social media post. 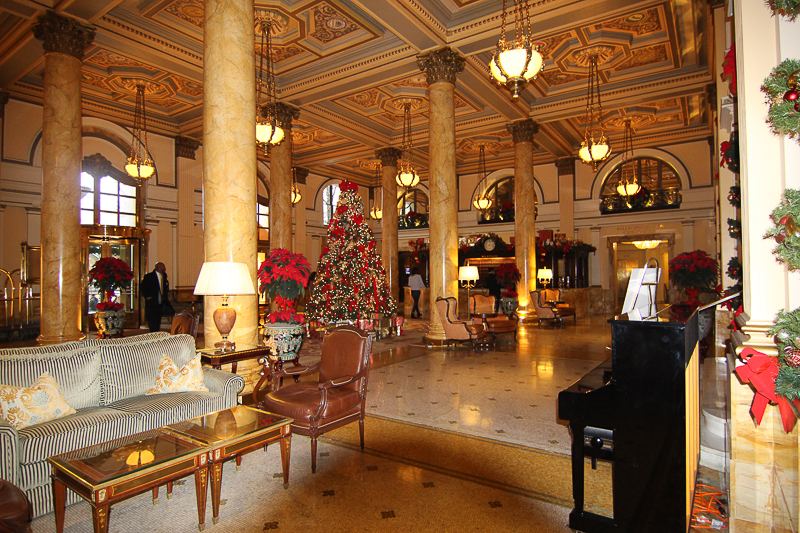 The current hotel was built in 1901 and has 335 rooms and one of the grandest lobbies in all of Washington. Every US President since 1853 has stood in the Willard lobby (both this Willard lobby and the previous one on the same lot). President Ulysses S. Grant used to walk over from the White House and sit in a leather chair in the corner and smoke cigars while reading the newspaper. People would approach him to talk about government issues and try to sway his opinion on governmental matters. These people became the first “Lobbyist” in Washington. Some still see President Grant quietly moving in the shadows of the lobby or walking down Peacock Alley. Sometimes, according to some staff members, there’s a faint smell of cigar smoke in the lobby. Since The Willard is a 100% smoke-free hotel, a whiff of cigar smoke gets staff attention . The scent quickly vanishes and the source, is never found. It was always a social win to be “seen” at the Willard. The long, wide corridor that runs from the lobby to the F Street entrance is called “Peacock Alley” because of the strutting that went on when people wanted to be seen in Washington. Martin Luther King polished up his “I Have a Dream” speech at his room in the Willard before he delivered the speech in 1963 just a few blocks away on the steps of the Lincoln Memorial. Mark Twain wrote two books in the Willard. Emily Dickinson stayed there as did Charles Dickens, and circus owner, P. T. Barnum who escorted the singer, Jenny Lind to Washington. 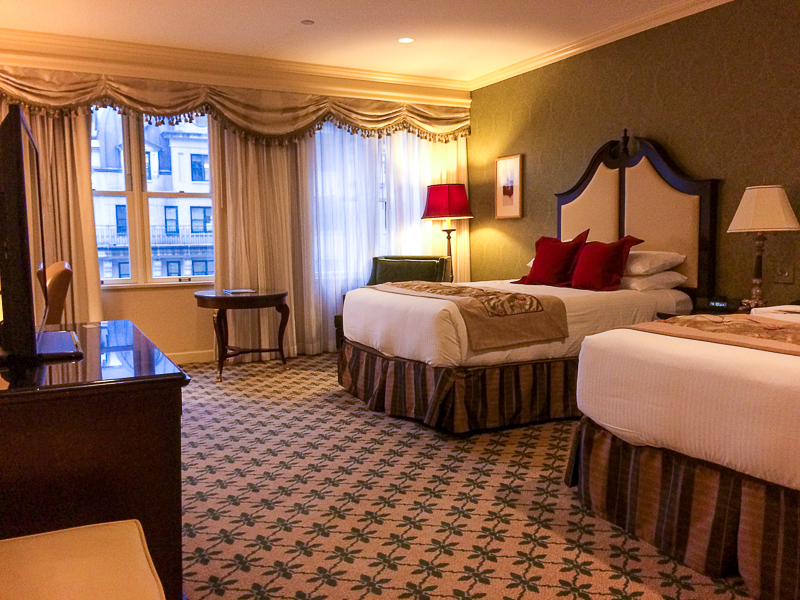 George M. Cohan wrote most of his plays and music at the Willard including the famous World War I song, “Over There.” And in 1862, Julia Ward Howe penned the lyrics to the Battle Hymn of the Republic while staying at the Willard. I asked several staff members it the hotel was haunted. Of course, they politely said, “No.” I am used to this. Believing in ghosts does not impart a “high class” image. But a bellman did tell me a story about the spirit of an elevator operator who haunts the elevators. Evidently, there was accident where an 18 year old elevator conductor fell to his death down the elevator shaft when he hopped on the elevator between floors and slipped. Sometimes, in the wee hours of the morning the elevators open on the lobby floor (and other floors) when there is no apparent guest to calling for the elevator AND no guest on the elevator. I searched the internet for more on this story and found a site that recounted an article that appeared in the Washington Post on August 15, 1903 CRUSHED IN ELEVATOR Conductor at New Willard Hotel Instantly Killed. Talk about sensationalism in the news media! The article evidently got worse detailing all of the gruesome injuries. But they say that people who die quickly sometimes don’t know they’re dead … and they keep on living right where the body left off. Thus …. an elevator conductor, still conducting 112 years after being squashed like bug. 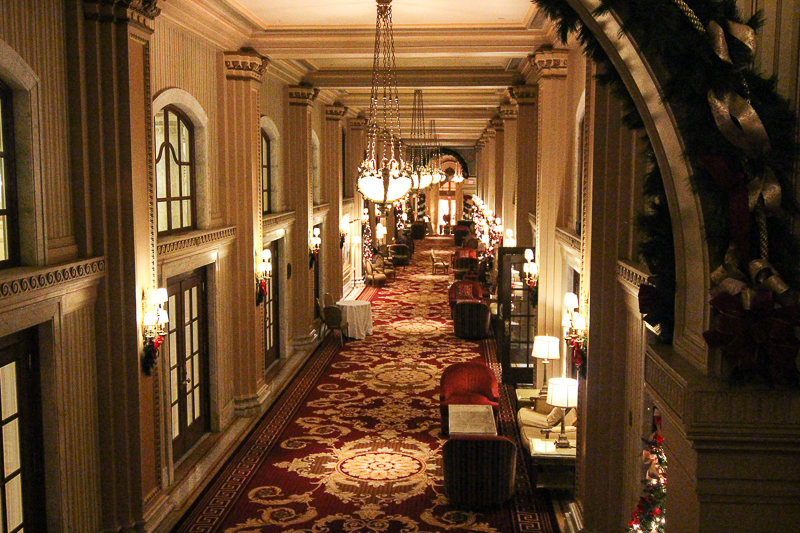 If you’re at all sensitive to spirits, you can feel them all around you at the Willard. There is a aura about the space. It hits the second you walk in. It swirls around you as you take in the drama of the lobby. It’s a kind of busy contentment. A very happy, but active energy. I’d love to spend a little more time there. The Willard at Christmastime would bring out the Christmas spirit in Ebenezer Scrooge. The Willard follow true to the form of its Victorian heritage, transforming Christmas by magnifying the old pagan traditions of greenery and baubles. The Willard has turned Christmas decorating into an art form seen in the grand tree in the lobby and the outside decorations that run the gamut of Christmas balls hung in the trees to a seven foot wreath hanging over the entrance to the Plaza. 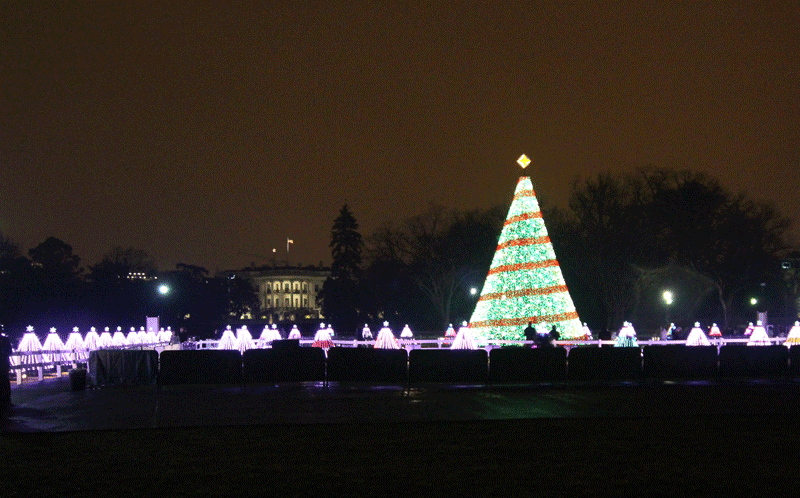 Christmas is everywhere – and it’s just enough. And with all the Christmas going on inside the Willard, there’s the National Tree and all of the state trees just outside, a block away. The rain and cold didn’t tarnish our Travel Hag Adventure to the Willard. It was all too short. Next year, we’ll do two night. So proud of the Travel Hags! Wish I could be one just like my daughter, Lisa. Ann, anyone can be a Travel Hag as long as you are a wise woman with goddess attributes. Lisa tells me you more than fit that criteria. So welcome to the club! Maybe we’ll do a tour of Chattanooga in the future. Thanks for the stopping by.